Anyone think maybe Coors Field screws with every teams’ focus and functionality upon leaving it? Case in point is San Francisco’s game Thursday the 5th, at home against another team fighting the Visual Memory issue, having arrived from a series in Arizona. St. Louis arrived in San Fran sporting a -9.60 VMI and therefore under the 95 mph 4-seamer by a little more than an inch. But, the Giants arrived home from Coors Field sporting a whopping -24.71 VMI. In previous seasons, the cumulative win percent for teams above minus 20 VMI returning home from Coors Field is 33.33% in their first games away from Colorado, and teams that move on to another road venue from Coors Field have a win percent of 36.84%. However, Cueto’s first game back was abnormal for him. His speed dropped from 94 mph to 90 mph so St. Louis took advantage of the one full inch less movement on his 4-seamer. Secondly, he threw more sliders than normal because his two-seamer was also getting killed. 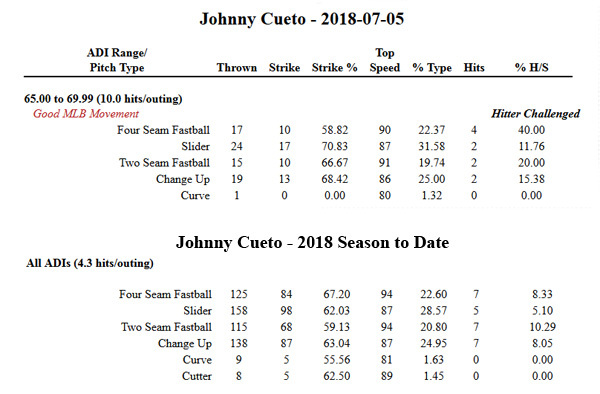 Cueto scored substantially higher as a Reverse Pitcher than is normal for him, and Reverse pitching is the worst thing you can do against a team sporting a -7 or higher VMI. Also, the hitting of San Francisco was atrocious. They got no hits off the four-seamer and looked like they belong on a Colorado team. But, that is no surprise, because when a team spends a full series in any stadium venue, they go away having become a team that is surprisingly similar to the team that resides there. The Giants got one hit off a Change-Up and one home run off a Curveball. In previous seasons, the cumulative runs per game for teams returning home from Coors Field is 3.0 runs per game and 3.6 runs per game when moving from Coors to a different road venue. Runs per game is over 4.0 runs when Coors Field was not the most recent game played.